Today it’s about these delicious scarlet runner beans which, to be honest, got into my shopping cart by pure accident, as I was looking for some random beans to make a salad, to combine some flavours I had in mind. 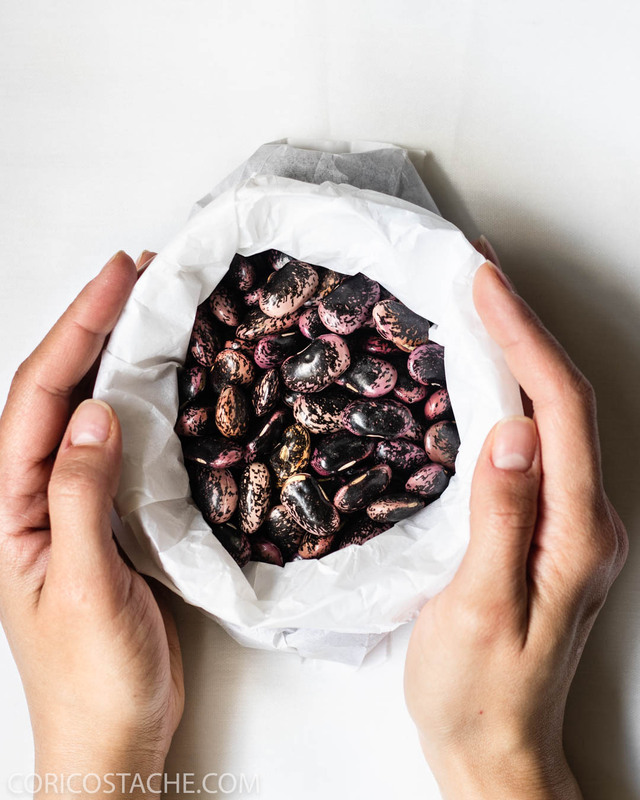 These glossy beans have a magnificent colour, a combination of black with dark purple and some brown spots from place to place. Scarlet runner beans or beetle beans how are they called here in Germany and Austria, are considered a typical dish in this region, and since our stay here has been extended more than expected, these beans will definitely be a staple ingredient in my summer salads this season. For my easy scarlet runner beans salad I used the dried ones, which will require overnight hydration and a longer cooking time, of about 1 hour or 90 mins in some cases. But these could easily be prepared in advance and kept in the fridge until you decide to make the salad. It happens quite often that I get inspiration for what I cook solely by thinking about a taste I’d like to recreate, and in this case was Pico de Gallo (recipe for this one will soon follow), and I was purely focusing on the tomato, coriander and lime combo, which is ..ohhh ..so unbelievably good. I hope you are on the “we love coriander” side, as this recipe is a totally different thing without it. And since there’s no salsa without chilies, some green and fresh ones could not miss from my salad, but I didn’t go wild on the spiciness this time 🙂 Reading Samin Nosrat’s book, Salt, Fat, Acid, Heat thought me so many amazing cooking tricks which I apply every time I want to enhance the taste of the dish, or avoid one, like the onion dragon’s breath. As much as I love raw onion, sometimes its spicy bite and the after taste are just too intense, not to mention the issues it may cause to people with gallbladder problems. And yes, you can still enjoy raw onion in a salad, or in any other dish, as long as you apply this small trick. All you need to do is to soak for 10-15 mins the chopped onion in lemon juice or vinegar with a pinch of salt. All the spiciness will now be tamed and you got yourself a pre dressed onion ready to be used in the salad. 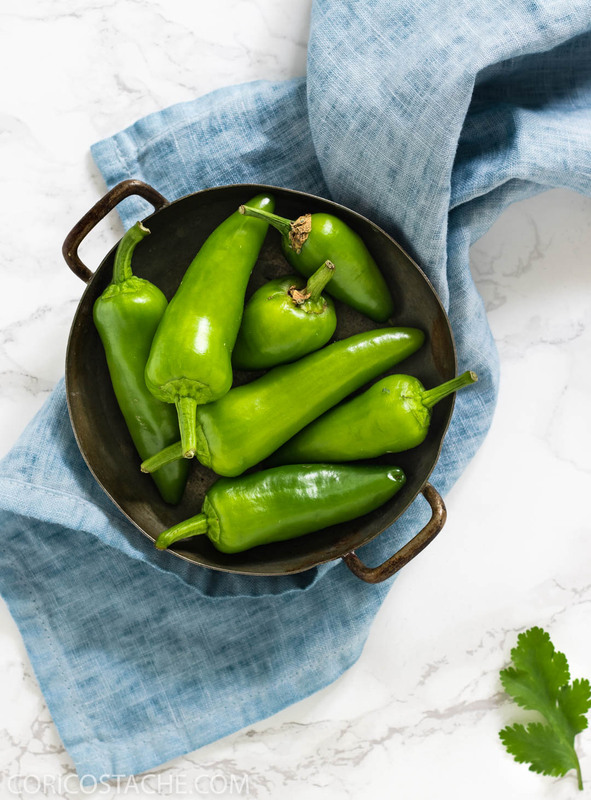 These type of salads are one of my favorites, as they combine the freshness of the coriander and lime with the protein of the beans, and they make a great side dish for any family lunch or dinner, especially in the warmer or hot summer days, when you can enjoy it to cool the heat down a bit. 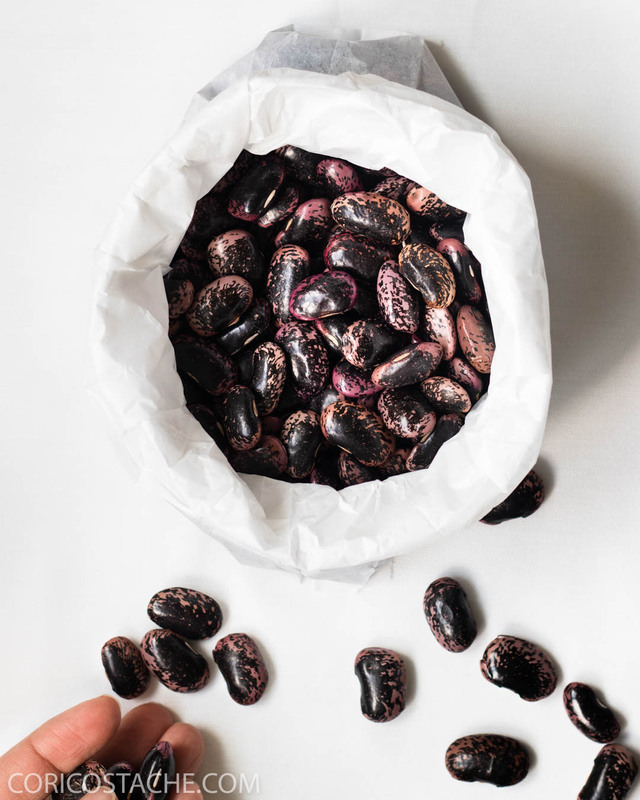 Soak the scarlet runner beans overnight or for at least 6-8 hours before cooking. Boil them for 1h 20 min or util they become soft. Soak the chopped scallions as mentioned before in lime/lemon juice with a pinch of salt. Let them aside for about 10 minutes. Deseed and remove the white membrane from the chili pepper and finely chop it. Chop the cherry tomatoes in half and finely slice the radishes. Add the finely chopped coriander, soaked scallions, olive oil, s&p and lime juice to taste. 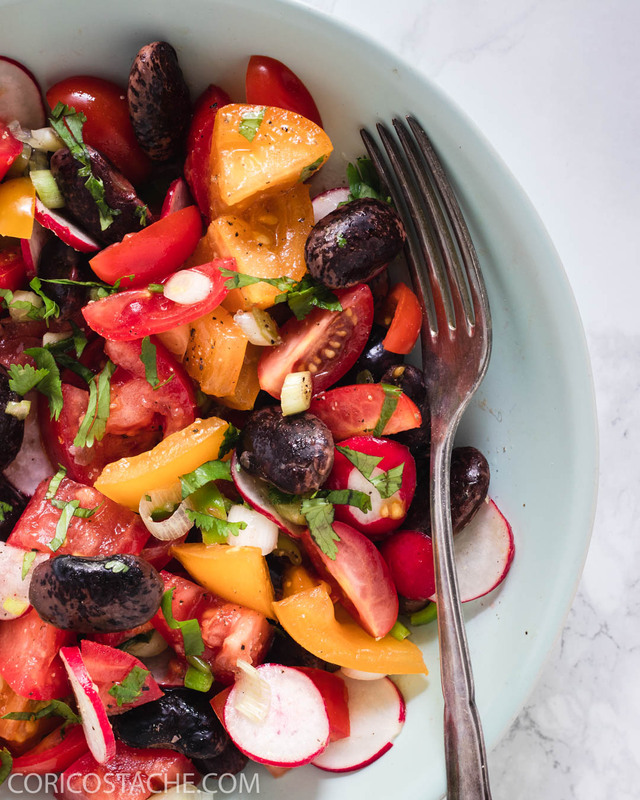 Toss all the ingredients in a big bowl until they are nicely covered with the dressing. Serve with a glass of cold white wine. Boil the beans ahead of time and refrigerate them up to 2-3 days.